I have been hiking regularly again. 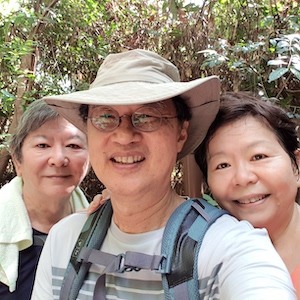 It has been a few years since I have been this regular hiking the Bukit Timah Hill. After the Hill was closed for works for about two years the trekking group continued with hikes all over Singapore. I wasn’t keen on those kind of flat ground and hot sun hikes. I had my eyes turned: cycling. So I cycled in those years when the Bukit Timah was closed for renovations and restoration works. I was pleased when the Hill was reopened and for a while I hiked there but ministry demands on Saturdays meant my outings there were erratic and occasional. This has however changed recently when my wife and I started doing the hikes on Mondays, the day off for pastors. So I use the Monday mornings and relish these hours of breathing fresh air, under a green canopy, in quiet and with less hikers around. Furthermore, I don’t have to worry about parking as there is free parking in the vicinity of the Hillview MRT. I usually walk from there to the Dairy Farm trail, along the Jungle Fall path, up the Summit steps, down to Rengas path and circle back to the Hillview MRT, a good two hours of perspiration and sometimes inspiration and thanksgiving. On my sabbath, it is always good to do something I relish, something that nourishes me.